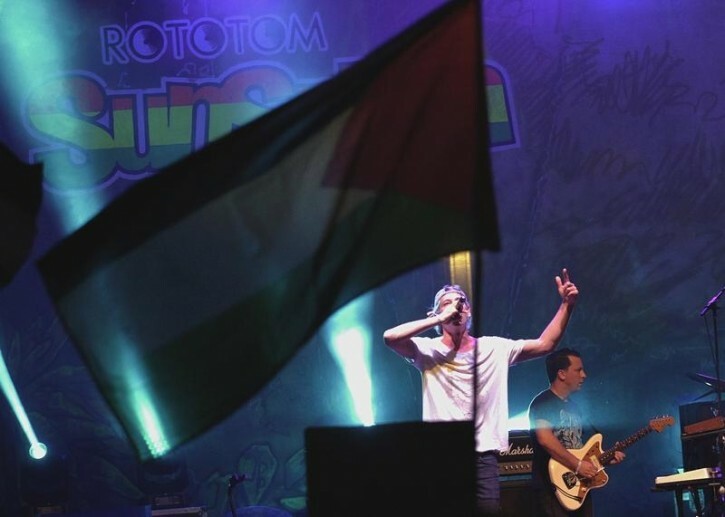 Benicasim, Spain - Jewish-American reggae star Matisyahu said he felt unsafe last week performing at the Rototom Sunsplash festival in Spain, facing a crowd that included a number of people waving Palestinian flags and flipping him the middle finger. “People were standing on each other’s shoulders with flags giving me the middle finger. It was intense,” Matisyahu said in an interview that appeared Sunday on the Daily Beast website. “I just assumed everyone in the festival was going to be regular reggae festival-goers, so I got really nervous. I felt totally open and that anyone could do whatever they want,” he said. Matisyahu performed at the festival a week from Saturday night after the organizers buckled under heavy pressure from the Boycott Divestment and Sanctions (BDS) movement in Valencia and disinvited him when he would not come out in favor of a Palestinian state, only to re-invite him when this sparked international outrage. 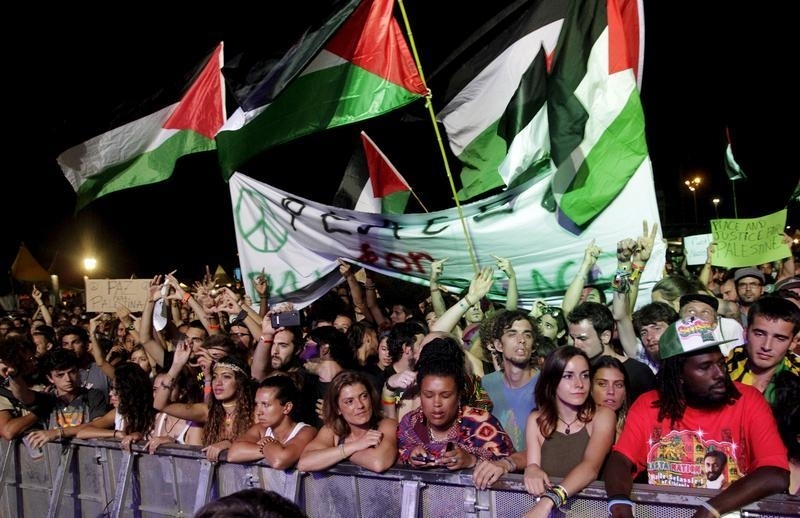 The singer said that when he was standing backstage before the show, he noticed a Palestinian flag in the audience, and that “about” another 20 flags came out when he stepped onto the stage. He said, however, that he did not include that song in his set as a statement, but rather because it was one of his most popular hits. According to the report, he also denied that the song is Zionistic. Regarding the Middle East, Matisyahu said, “I’m not a political scientist, and I don’t claim to know all the details and the facts of the Israeli-Palestinian conflict. I haven’t chosen a side,” he said. The former Chabad hassid said that the organizers of the festival e-mailed him at the beginning of the whole affair and told him that they they were getting pressure from the BDS group, and that they could “make the group go away” if he would make a statement in support of Palestinian statehood. “At that point, I said I wasn’t comfortable and if they didn’t want me there, I wasn’t interested in being there,” he said. Matisyahu said he “absolutely” felt he was the victim of anti-Semitism, saying he has never experienced anything like that before. “I’ve been touring in Europe even from the time I had a beard and yarmulke, and I had never been with people who expressed what I thought was outright anti-Semitism,” he said. What do you expect from the religion of 'peace' and the descendants of Fernidad and Isabella? Once a chassid of the rebbe, ALWAYS a chassid of the rebbe. Maybe he doesn't put on a tallis katan and teffilin every morning but in terms of convey the essenece of a yiddeshe neshama, he has no peers among the usual list of top artists like LIPA, MBD, etc. Rabbi Avigdor Miller said that antisemitism is put into this world so Jews would not assimilate. Throughout history when Jews lived during peaceful times intermarriage and people not following the Torah were at an all time high like we see today in America. Matisyahu, you've experienced antisemitism firsthand use this as a warning to live a moral and just life and follow the Torah. Hatzlachah. Kol Hakavod for Matisyahu! singing "Im eshkachech Yerushalyim" in front of all those anti semites! You make us proud !! You kept your cool, looked the beast in the eye and said "I'm proud to be a Jew".